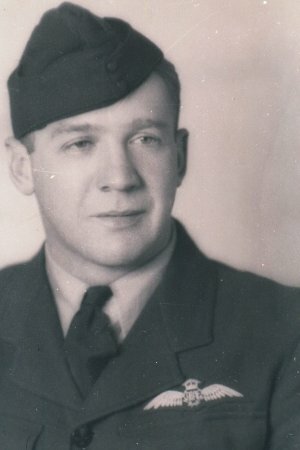 This photo was taken when Reg was awarded his wings, in Halifax, just before embarkung for the UK. Reg went to Bethanga State School, then Albury Grammar School, where he was school captain. After leaving school, he was dairy farming with his brother Claude on the family farm (Holdsworthy), on the edge of the Hume Weir near Bethanga. When the farm was unable to support the two of them, Reg left to join the Police Force. He was a good footballer, playing for Bethanga, and played a couple of games for Hawthorn He was not married, and just short of his 31st birthday when he was shot down over Berlin, flying a Lancaster Bomber. The family have some of his letters from his years in the RAAF. (2) July 42 (1.2MB PDF) - written on board ship on the way to Canada. Good descriptions of a shipload of Airmen off to war, and horseplay when they crossed the equator. (3) Late 42 (0.7MB PDF) - from Dunnville, Canada. More training. Some of it sound quite scary. 10/10/41 Enlisted, straight to ITS (Initial Training School , Somers). 28/12/42 Halifax, embarked for UK The 10 day trip to the UK was presumably by ship, during the height of the Battle of the Atlantic? 20/4/43 Lichfield (Advanced Flight Training), probably Oxfords. Lichfield is 15 miles north of Birmingham.